No matter where you live, you’ve probably just endured a blistering few months of extreme weather. At times during the past week, we’ve seen temperatures exceeding 40°C (105°F) in southern parts of Australia and almost 40°C (-40°F) below freezing in parts of North America. Few buildings are able to keep occupants comfortable during such onslaughts. In fact, typical commercial buildings in most Australian cities are designed to maintain regular temperature bands only when the outside air is below 32°C with humidity below 50%. When the weather heats up, office temperatures can be expected to rise. While a building’s design is largely static, the way it is operated need not be. Drawing on data from the fault detection and optimization analytics we provide for many of our customers’ buildings, we’ve identified that active management of peak electricity demand dramatically increases their “capacity” to handle extreme weather. We’ve described our peak demand forewarning system in detail previously. 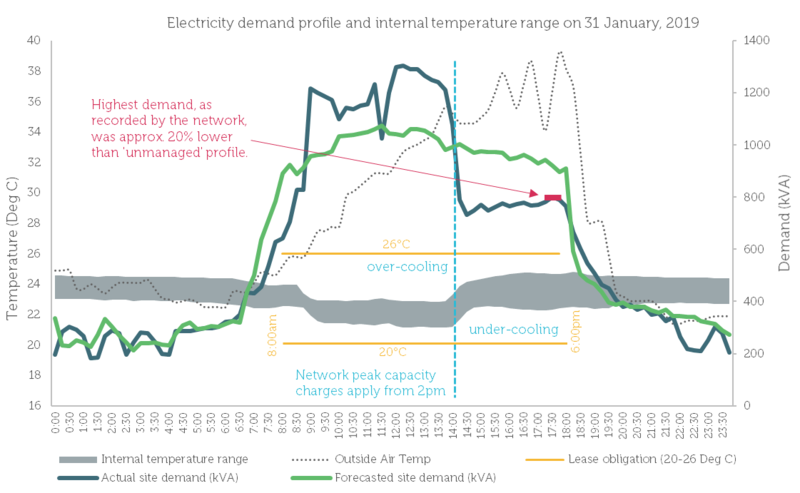 By shifting heat loads in response to advanced peak demand ‘forewarnings’, operators (e.g. chief engineers, facilities managers, operations managers) are able to hold plant capacity in reserve for the most adverse of conditions by tricking their systems to increase demand ahead of time. The following plot illustrates what’s been going on this summer at one of Australia’s most prestigious office towers. In this example, the building is required to keep internal temperatures below 26°C in all zones, at all times – unless design conditions are exceeded. In the absence of forewarning and fore-action, the load would have steadily increased throughout the day and a new ‘peak demand’ capacity charge would have been set for the year. Instead, the operations team decided to drop internal temperatures throughout the morning (still maintaining conditions within a comfortable band) and then allow them to gradually rise back up during the afternoon peak. Energy consumption was unaffected (there was no net increase) but peak afternoon load on the grid was reduced by approximately 20% and comfortable conditions were maintained. A win-win! Obviously, no tenant is going to be happy if in response to their complaint about hot, stuffy conditions their building manager says something like “sorry mate, it’s really hot outside and we’ve lost control”. That increasingly common situation is not just a frustration for occupants, it represents an unnecessary load on strained electricity networks that these days they could certainly do without. All western perimeter-mounted thermostats were excluded from the analysis as many were registering radiant temperatures directly from the (blisteringly hot) façade and not just air temperature in the occupied zone. Note the electricity company in this location applies capacity charges based on a rolling 12-month maximum demand between 2pm – 8pm.